You can set Pages to flag spelling errors as you type, and you can check your entire document or selected text for misspellings. Pages can also check grammar and look up the definitions of words. Use the Spelling and Grammar window (shown below) to check spelling and grammar, add terms to the dictionary, and change the language of the dictionary. When you add terms to the dictionary, you teach Pages new words so that it doesn’t mark them as misspelled. Choose Edit > Spelling and Grammar > Show Spelling and Grammar (from the Edit menu at the top of your computer screen). Check Spelling While Typing: Underlines misspelled words in red. Check Grammar With Spelling: Underlines misspelled words in red and questionable grammar in green. Correct Spelling Automatically: Underlines misspellings in blue as you enter text and briefly shows its replacement. If you disagree with the replacement, click the x in the suggestion bubble to keep your entry. Control-click a misspelled word, then choose one of the options in the shortcut menu. If a word is spelled correctly but it’s underlined in red, Control-click the word, then choose Learn Spelling. The word is added to the dictionary so it won’t be marked in the future. Use the pop-up menu at the bottom of the Spelling and Grammar window to choose a language for spell checking. 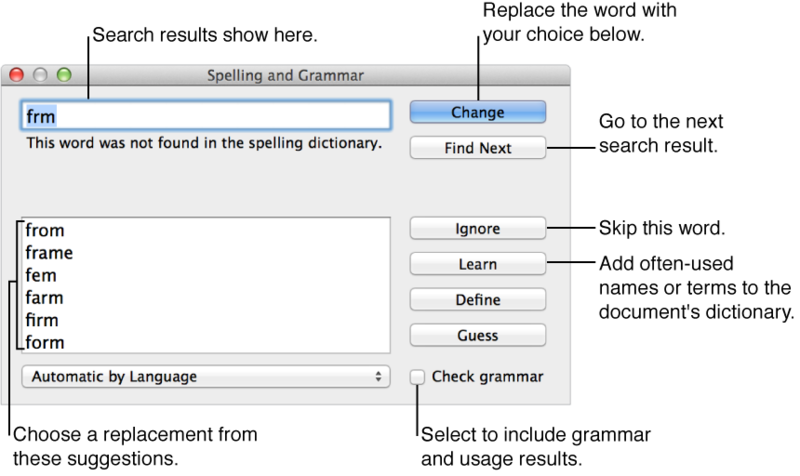 You can set up your Mac to check spelling for different languages. Spell checking must be set to Automatic by Language. Open System Preferences on your Mac, click Keyboard, then click Text. System Preferences is under the Apple menu at the top-left corner of your computer screen. Choose Set Up from the Spelling pop-up menu. Select the checkbox next to languages you want to be checked. Make sure the Spelling pop-up menu is set to Automatic by Language, then close the keyboard preferences window.